Adrian Clarke looks at tactical battles set to take place in Matchweek 7. There will be intriguing individual battles wherever you look when Chelsea entertain Liverpool on Saturday but few areas of the pitch will be as important as those occupied by the full-backs. 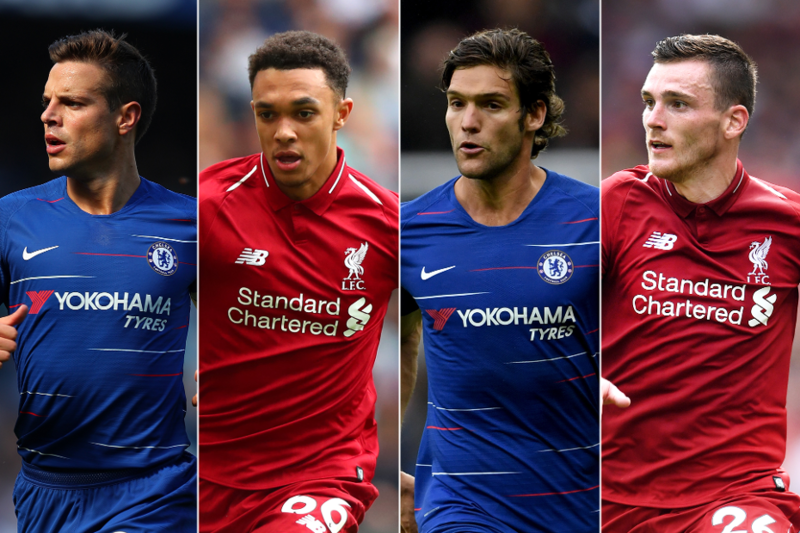 Cesar Azpilicueta, Marcos Alonso, Trent Alexander-Arnold and Andrew Robertson are key to the both teams' attacking plans but they will also have a defensive task to contain a quartet of elite wide forwards. With both managers strong advocates of a 4-3-3 formation using wingers encouraged to go inside to score goals, the full-backs on both teams are expected to provide width. This suits all four, especially those on the right. Alexander-Arnold loves to fly forward for Liverpool when Mohamed Salah takes up positions as a striker and the teenager delivers a stream of crosses from advanced areas. Azpilicueta’s right foot is a consistent source of accurate service for Chelsea forwards Olivier Giroud and Alvaro Morata. The Spaniard tops the list for producing crosses under 18 yards in distance, alongside Southampton’s Nathan Redmond, with 20. Joining him towards the top of these rankings is his team-mate, Alonso. Seventeen of his 19 crosses have also been from short range. This proves how well Chelsea get both men on to the ball high up the pitch. Defensively, all four full-backs will face a stiff examination at Stamford Bridge. Willian and Salah have made 33 chances between them across the opening six matches and are ranked in first and second respectively in this department. Sadio Mane and Salah have each managed 10 shots on target, too, a tally that is only bettered by Fulham striker Aleksandar Mitrovic. For Chelsea, Eden Hazard, who scored a sensational solo goal in the Carabao Cup on Wednesday night, is the in-form player, having created 12 chances and managed seven shots on target. Is there a weak link that either side may look to exploit? The least defensive of all the full-backs is Alonso. He is prone to the occasional lapse in concentration or poor positioning and has a habit of leaving space behind him. For this reason expect Liverpool to target his channel at Stamford Bridge. His Liverpool counterpart, Robertson is a lot more comfortable when defending, and is an excellent tackler. Hazard’s superb movement off the left wing will test Alexander-Arnold, but last season the Liverpool defender proved himself capable of shackling big-name players. He put in an impressive display against Manchester City winger Leroy Sane. In this match he may have to pass Hazard occasionally on to team-mates inside him so that he can look after Alonso’s marauding runs. Alexander-Arnold is an intelligent player, though, and equipped to handle the challenge. This promises to be a brilliant duel between two formidable Premier League sides. With most of the individuals on show in fine form, any number of players could make the difference. But both managers will certainly look for strong displays from their full-backs, whose contributions, with or without the ball, will be vital.